When you work from home, it’s easy to distract yourself and lose focus. One minute you’re on the phone with a client, the next you’re tempted to take a midday nap, the next you’re delivering a service, the next you remembered that you haven’t vacuumed your home office in two months – and so on. At The Yard: Midtown Village, I’m not nearly as distracted as I would be at home. Here are six ways having a coworking space in Center City helps me stay focused throughout the work day. When you work from home, it can be difficult to separate your home and work life. It’s incredibly important to work away from your home as often as you can so that you can stay motivated and productive. Although I do sometimes work from home, I rely on a coworking space to create a focused space. When I’m at The Yard, for instance, I stay on task, strictly sticking to business. It’s much harder for me to do that at home, when I can easily slip into the kitchen for a snack or into my bed for a nap. I love working in coffee shops, but let’s be real: they’re not quiet. At all. A coworking space provides that quiet atmosphere I need without the hustle and bustle of a cafe setting. No chit chat, and no complaints about getting an order wrong. It’s a much more professional setting. 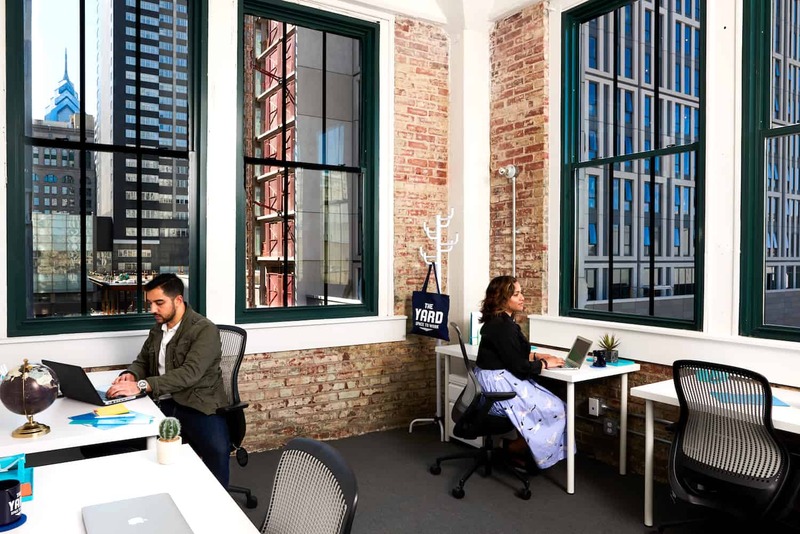 On the other hand, coworking spaces aren’t exactly libraries either, so you can whisper and connect with others in common areas and lounges. It’s much more laid back and relaxed. I love coworking spaces because I’m rarely interrupted. I’ve always loved who I’ve lived with, but it can be difficult to create a firm boundary while working from home. Plus, if I’m at home, I’m the one expected to be present when the delivery person, plumber, etc. comes. While it’s not a big deal, having another person at the apartment breaks my concentration fairly easily. The Yard has modern kitchen spaces supplied with coffee by Elixr and tea by Kusmi Tea. You know what that means: free caffeine all day, available at your convenience. They even have almond milk for those who don’t consume dairy. In other words, you won’t waste time brewing your own pot of coffee or spend money purchasing another mug’s worth in a coffee shop. Fresh beverages are already at your fingertips. Whenever I walk into a coworking space, I’m never the only one there. While I might not say a word to another member for hours, as I’m deep into my workflow, it’s reassuring to know I’m not the only one working. I’m not alone. Additionally, The Yard offers tons of events to take advantage of, especially if you need to take a break from your work to recharge. I don’t know about you, but when I’m at home, the most comfortable spot is my bed. For those who work at home, this isn’t a healthy habit at all. Fortunately, The Yard has comfortable (and sustainably designed) seating that not only suffices, but keeps you engaged with your work without sacrificing comfort.